Sears Maid Services has the cleaning professionals you can trust. We have a team of professionals that have operated locally and possess years of experience. Our team will clean everything from the cobwebbed floorboards and dusty ceiling fans to ovens and cupboards, inside and out. The services we provide are not only limited to residential areas; Sears Maid Services answers the call for those needing commercial cleaning as well. We will work for you whether it is a deep spring cleaning to get to the nooks and crannies, or if your needs require, a regularly scheduled service. 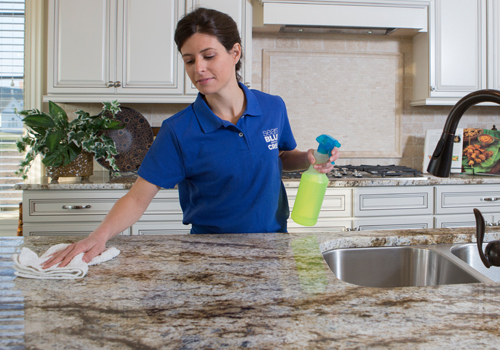 Sears Maid Services will provide you with the staff to keep your home and your business fine-tuned and fresh. Give us a call at (301) 461-1797. Scheduled cleaning services at Sears Maid Services will help you when you need a regular cleaning service. We will provide you with maid servicing according to your schedule and needs. We offer a variety of scheduling choices to meet your needs. We offer scheduling for apartment and home cleaning from a weekly to a monthly schedule and nearly anything in between. We work around your busy schedule offering you a timetable that satisfies your needs. There are several times a year when a thorough deep clean is needed, and Sears Maid Services will provide this Deep Cleaning service for a more detailed cleaning. This service will not only include all of our normal cleaning benefits but will also offer areas that require additional attention. Every business is a product of its ideals, standards, and organization. These attributes create a more comfortable environment for the staff, clients, and visitors. The staff at Sears Maid Service will remove the clutter from your office, maintain a precise, clean environment and allow your business to look well kept and professional at all times. Sears Maid Services will eliminate dusty counters, tidy lobbies, and remove trash from trash cans so that everything is ready for the next business day. A well-maintained work environment will enhance the professionalism of your business establishment and give your staff and clients a sense of working in a well-cared for business. Constructing a new home requires many tools, materials, and chemicals. Everything from setting carpets, spackling drywall, and installing fixtures leaves behind debris, silicon, odors and dust. The professionals at Sears Maid Services offer their service in making your new home showcase-ready. Prospective buyers will see what the home has to offer, and the inspectors will not get inundated by mess while performing their duties. Sears Maid Services professionals are experienced in Post Construction Cleaning and will comprehensively clean your house. Not only will they mop, dust, vacuum and wipe down walls, the staff will also remove chemical debris from the site, and sanitize all surfaces. The professionals at Sears Maid Services will help make a newly constructed home clean and ready for move in. At Sears Maid Services, we are true to our word. Our staff of professionals are thoroughly trained, screened and vetted during the hiring process. We conduct background checks and screen potential employees, looking for compatibility with our standard of integrity. The intimacy that is involved in opening your home or business to a cleaning service requires unequivocal trust. For that reason, we train our professionals to adhere to proprieties and laws of good conduct. We give our staff extensive training, before and during their employment, in up-to-date methods and techniques required to do a thorough and excellent job for you. Sears Maid Services is here to provide you with the best services our maids have to offer. We are confident that we will provide you with a service that is beyond your expectations. However, if by some chance we have missed something, we will come out and fix the problem at absolutely no cost to you. Just call us with the issue within 24 hours of the cleaning in question and we will provide someone to come out to inspect and discuss the issue. There will be no charge to you and Sears Maid Services will make it right.